The electric guitar is fast-growing to take its place across music genres. The diversity of sounds, styles and effects richly add to the dynamics of the band as well as for individual appreciation. 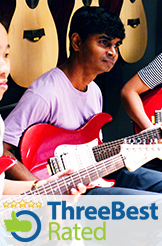 Engage and discover new dimensions of expression with the electric guitar in our classes. Find the musician in you and experience the wonder of music in our classes. Use songs to speak the thoughts from your heart and soul, this is personal art at its very best. The Contemporary Electric Guitar Program™is a broad spectrum syllabus designed to meet the needs of aspiring individuals with the proper techniques to play and sing casually for both individual and social enjoyment.. If you dreamt of playing the electric guitar skillfully...We will take you there.